"I will not die an unlived life. I will not live in fear of falling or catching fire. I choose to inhabit my days, to allow my living to open me, to make me less afraid, more accessible; to loosen my heart until it becomes a wing, a torch, a promise. I choose to risk my significance, to live so that which came to me as seed goes to the next as blossom, and that which came to me as blossom, goes on as fruit. " From "50 Inspirational Quotes to Power Up Your Inner Badass." "This iced tea float is genius! ", I thought when I first read about the recipe in a book called, "Best Places Seattle Cookbook: Recipes from the City's Outstanding Restaurants and Bars." First you make some strong, sweetened iced tea, turn it into a sorbet, then float it in unsweetened iced tea for a refreshing drink that slowly sweetens the iced tea as the sorbet melts. The creator, Kaspar Donier of Seattles Kaspar's says a batch of leftover iced tea inspired this sorbet creation. He uses Earl Grey tea, I chose black tea with fresh mint and lemon. Recipe below. 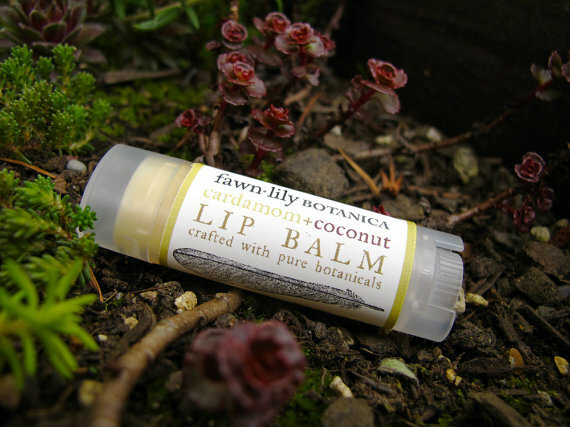 Cardamom and Coconut Lip Balm by fawnlilybotanica - I'm in love with cardamom so I bought this yesterday. She not only uses organic cardamom oil, but also infuses the sunflower oil with organic cardamom seeds. I can't wait to try it! They also have a Vanilla Bean Facial Wash that looks equally fabulous. 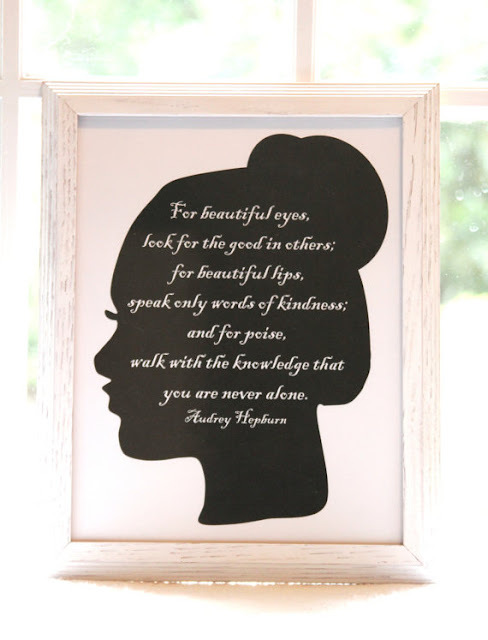 I've always loved this quote, and what a beautiful reminder hanging on the wall. 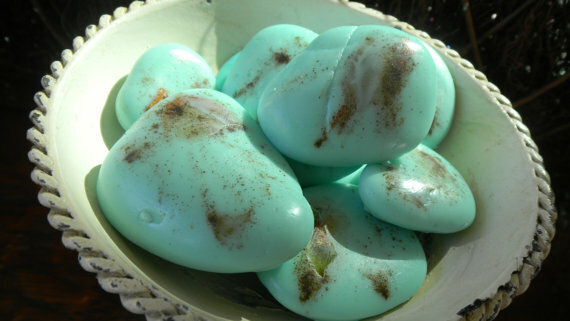 Shea Butter Turquoise Stone Soaps in Cool Water- By Beacon Hill Candles- I love the beauty of these turquoise stones. With Shea butter and coconut oil they are moisturizing as well. A great addition to a guest bathroom. By SamBraundJewellery- this ring caught my eye then I read about it and loved it even more. Now I think of it as the Pirates of the Caribbean Ring. Here's the description- "This collection is inspired by myths and legends surrounding Mermaids, and their Siren songs that would lure mariners towards the rocky coastlines, causing shipwrecks to occur. These rings are made with these mythical seductresses in mind. The gemstones are polished smooth by the sea, having fallen from these shipwrecked vessels and settled on the ocean bed, where over time coral and barnacles have encapsulated the gemstones creating part living sculptures. 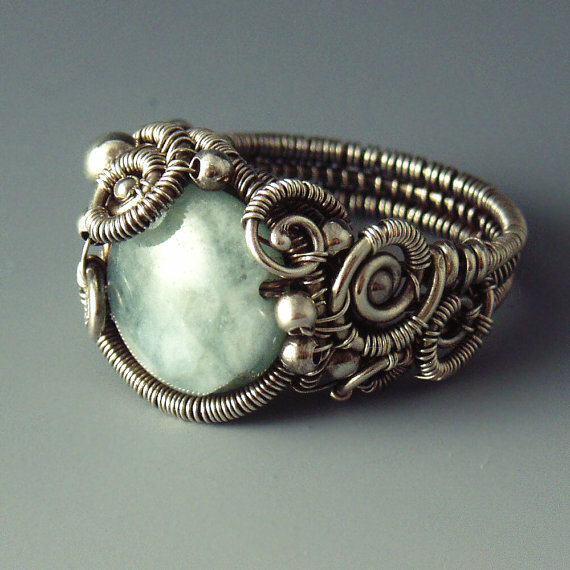 Each ring is uniquely sculpted in Sterling Silver, with woven swirls depicting the coral, and Sterling Silver beads to represent the barnacles. The silver has been oxidised to create an antiqued look, which serves to highlight the intricate weaving." 5 - 7 strong black tea bags - I used Welsh Tea (which is a great black tea by the way and it is very strong) BUT if you are using a regular black tea, like English Breakfast by Stash or Lipton, I'd use 6 or even 7. OR if you want to use Earl Grey, use 6 Earl Grey tea bags. To make the sorbet. First make some strong tea by adding the water to a saucepan, then add the sugar and stir it. Almost bring it to a boil. Add the tea bags and mint, and remove the pan from the stove. Cover it and let it steep for 30 minutes. Remove the tea bags, squeeze out the tea from the bags and discard. Add the lemon juice. Now you can either leave the mint in the sorbet base while it cools, if you want a stronger mint flavor, or you can remove it now. Refrigerate this till it's very cold, at least 4 hours. Now remove the mint if you haven't already. Process the sorbet mixture in the ice cream machine according to manufacturers instructions. Freeze mixture until firm, at least 2 hours. When you are ready to serve, first let the sorbet sit out a few minutes until it's soft enough to scoop. Add a few scoops of sorbet to a glass, then fill glass with iced tea and garnish with fresh mint. You can also serve the sorbet as a refreshing dessert with some tropical fruit if desired. IF YOU DON"T HAVE AN ICE CREAM MACHINE, Make an Icy Slushy- Make the sorbet mixture as directed above. Pour it into a shallow dish in the freezer. Scrape it after it starts to freeze. About 30 minutes later, scrape it again. Keep scraping it every half hour or so till it's icy and frozen. Just like my Honeydew Ice. Put this mixture in a glass and add iced tea to it to make an icy slushy. This sounds sooo good! Thanks for posting. I can't wait to try this! "Very Cold Unsweetened Iced Tea" - what does that mean? what kind of tea? just any and then put in the freezer? is the liquid element the sorbet is floating in. So just make some iced tea (I use lipton) according to the package instructions, and float the sorbet in it. No you don't put that part in the freezer, first you make the sorbet above the Very Cold Unsweetened Iced Tea, in this post. Lea- Actually you could put it in the freezer to get cold, but don't let it freeze. I mentioned it needs to be very cold because if it's room temperature the sorbet will melt too fast. But the fridge should make it cold enough. This is gorgeous! I don't have an ice cream maker or the patience (or focus) to scrape the sorbet that often, but I bet it would freeze really well into ice cubes!! 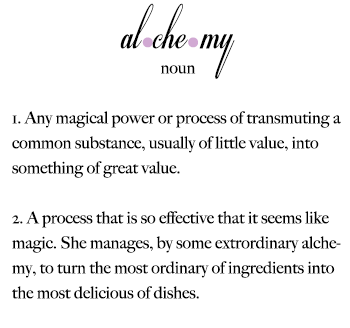 I think I have to start experimenting... I'm really excited to try this soon. Will keep you posted (you've been pinned). We will just love this awesome Iced Tea Float. Hope you are having a fantastic week and thank you so much for sharing with Full Plate Thursday. This sounds so yummy and perfect for a warm summer day! Thanks so much for sharing it at Inspiration Friday this week!